CAST IN GRAY is being made into a feature film titled GRAY IN WHITE AND BLACK. 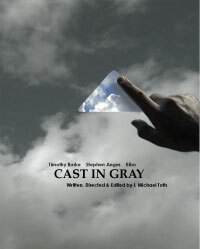 Make a donation of $25 or more below and we’ll send you a complimentary DVD (w/Director’s Commentary) of CAST IN GRAY. Your donation goes towards funding the making of GRAY IN WHITE & BLACK. Copyright © 2004 Life is a Dream Productions Inc. All Rights Reserved.